Cucumber beetles come attired in either stripes or spots and both are native to North America. 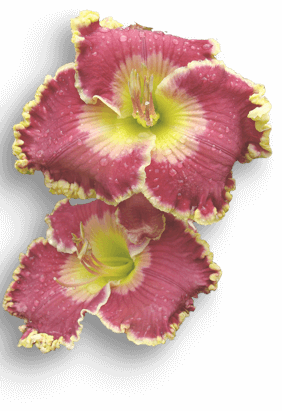 Both dress variations have been reported on daylilies. There are eastern and western versions of both the Spotted Cucumber Beetle, Diabrotica spp. and the Striped Cucumber Beetle, Acalymma spp. ; the eastern Spotted Cucumber Beetle is also known as the Southern Corn Rootworm. The adult beetles are roughly a quarter inch in length, the spotted version having 11 black spots (or twelve if you count one large merged one as two); three black stripes adorning the striped cucumber beetle. The wormlike larvae of both beetles feed on several different plants below soil level (but only cucumber and squash family plants in the case of the striped cucumber beetle). The adult beetles chew on foliage and blooms of a range of ornamental plants and vegetables. There is one generation per year in the north, up to three or four in the south. Most suggested non-toxic controls are not appropriate for ornamental plantings, e.g. floating row covers, deep straw mulches, interplanting with radishes, etc.